Sunlight is coming down onto the gate scene from the top right, highlighting the right hand side of objects & casting shadows to the left. Notice also the grey mouse at the bottom right, peering out of a crack in the gate wall. There is also a blue bird asleep in its nest in the wall, in the top right hand corner of the scene. The Pale version has a limestone yellow overlay across the wall stones in the background. 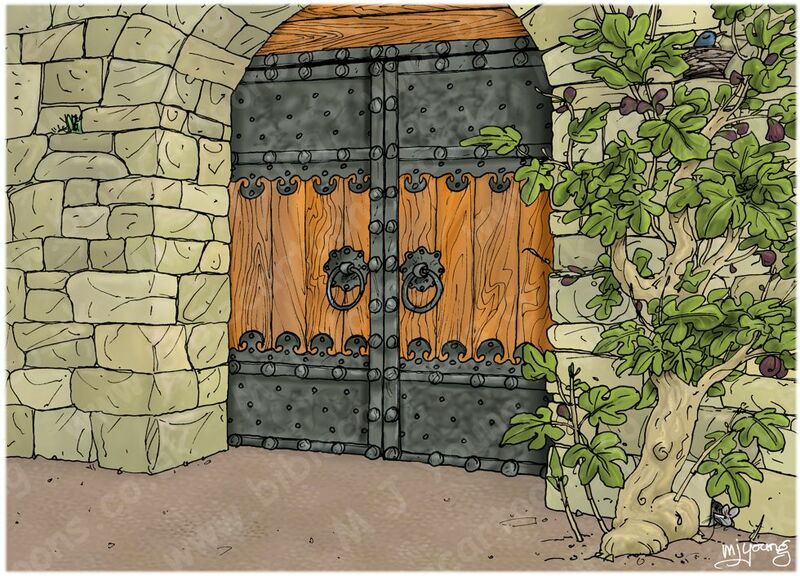 There is also a subtle “deadening” of the orange brown wood & grey/black metalwork of the gate. Lazarus also has a plum coloured outer robe, which is designed to contrast more highly with the background wall colour than in the other two versions of this scene. 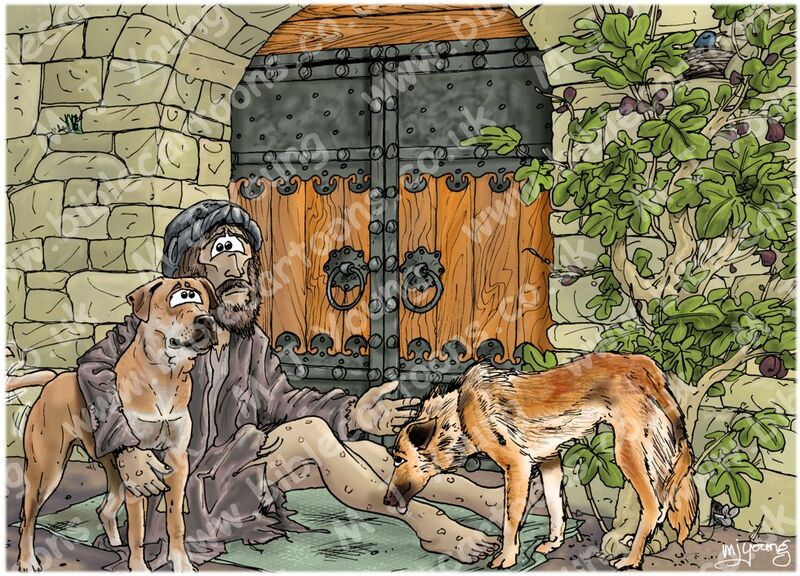 I have shown Lazarus in rags, sitting on his mat. Notice the patch on his outer robe sleeve. The sores mentioned in the Bible text above can be clearly seen on his skin. 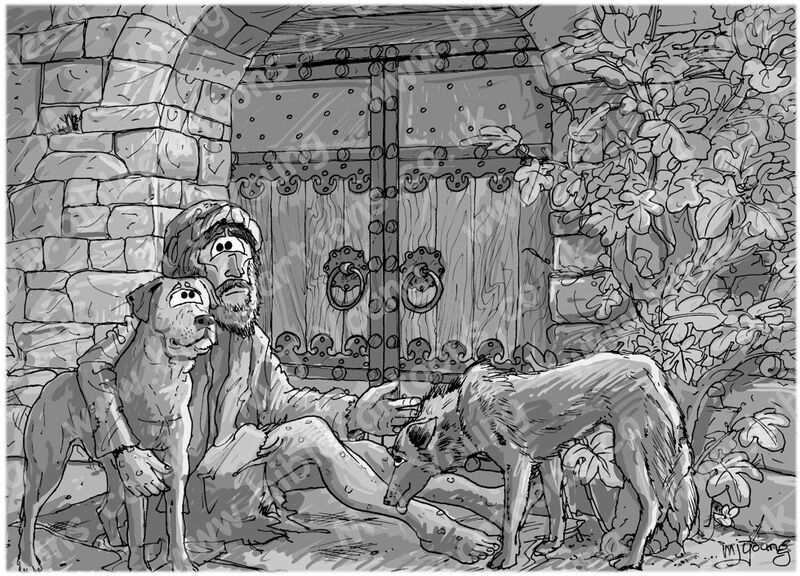 I have drawn two dogs with Lazarus, one of which is licking his sores, as per the text. 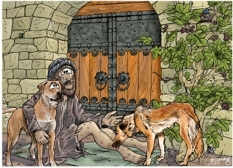 I have imagined the dogs being friendly towards Lazarus, perhaps they are his only companions? I wanted to depict an ornate, expensive looking gate into the rich man’s house, hence the detailed ironwork on the hinges & bindings. I have also elected to show rich orange/browns in the woodwork, perhaps the gate is made of some rare, expensive wood too?! The shrub or tree to the right of the scene is a Common Fig tree (Ficus carica). Here’s the scene in greyscale form, which I create before I colour up a scene, to get the tone (light and shade) right.